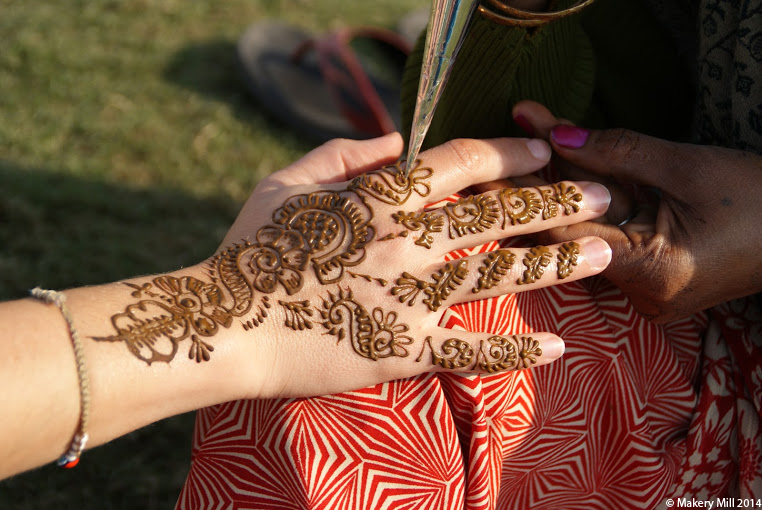 It wouldn’t be right to write about Indian crafts and not include henna. It is fascinating to watch a henna artist at work. A steady hand is required to use the piping bag, and a big imagination full of complimenting designs is needed to quickly decide what detail is coming next. It is rather like a doodle, but with a deliberate creativity and theme. The dye lasts for a week or so, before it starts to fade, so it is important that the wearer likes it. I was delighted with mine, and would love henna to be a more popular trend here in the UK. It is great for people like me who change their minds too often to risk the permanence of a tattoo! I’m going to get Becky to have a go at this – her cake piping is so controlled, that I think she would make a perfect candidate for an in-house Makery Mill henna expert. What do you think? This entry was posted in Crafts, Painting, World.